Hello my lovelies, can it really be that we are saying hello to Friday again! You will not hear any complaints from me. I’m all ready to say hello again to Mr weekend. Around these parts I like to share a few favorite finds I have discovered during my weekly blog readings. 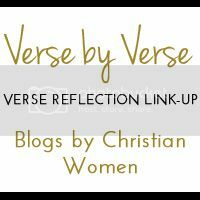 This Friday before I veer into that I’m going to take a slight turn to take part in Blog by Christian Women’s first Verse by Verse link-up. Jess challenged us to memorize Romans 8:25 and to share a few reflections on the verse. I found this verse challenging because it contained two words that I have not grown very fond of lately. Can you guess which two they are? Wait and patience. Yep those are the two I struggle with repeatedly. There are some desires I have not yet seen come to pass but I must examine if I’m in fact full of hope or am just observing the passing of time with wishful thinking. As I reflect on this passage of scripture, I see there is a difference between the two. In our humanness, there are matters that lie outside of our control. We must simply wait. But how we wait is a matter of our choice. Our time of waiting can either bring disappointment and disillusionment or we can allow the time of waiting to enlarge us. I want to be enlarged in the wait! How about you? Ok now for my recommended reads for this weeks. Will You Hear My Heart by Jeannie .A reminder that sending our words alone is not enough but but we need to allow others the opportunity to see into the heart of us. I’m Sorry I Can’t Read Your Blog Right Now by Tina a great reminder that some times that best little gift we can give ourselves is to step away from all the information overload so we can get busy creating and writing for ourselves. The Wonder of Your Life in Christ by Amy for all those moments you lose the wonder of being you. Counterfeit Happiness by Anna a reminder of all the ways we become a bit like Judas. I love the message translation of the verse! Times of waiting can be difficult but are also times of growing. Thanks for linking up with us Wanda. We have to remember that times of waiting is not wasted. We can not see the growth that takes place within us but it’s happening nonetheless. Wanda, I love your inspirational post on hope, because I’m currently keeping a Hope Journal. I went through a rough patch and my hope and confidence was bruised. However, I refuse to let it take me down. Hi Marilyn, I like the idea of a hope journal. I’ve kept a journal off and on for years. I understand what it’s like to have your confidence and hope be in need of stirring again. Yet it is certainly possible. HI Wanda! That is a great metaphor for waiting isn’t it? You really do get bigger waiting in pregnancy. And if you don’t wait long enough, things can get dangerous for the baby. I love this! Yes, reading The Message version of the passage gave it a new meaning. The waiting serves a purpose indeed. Wishing you a wonderful weekend as well Ceil. I really appreciated this post! I can surely relate to how hard it is to wait on the Lord…waiting can feel like such a waste of time. Over the past couple of years, we have been through so much, walking from one fiery furnace straight into another, it seems. Many times, the only answer I have been able to hear from God when I pray is, “Be still, and know that I am God.” Stillness…waiting….so hard for us to do. But, so much is going on under the surface and behind the scenes. If we only knew what God is doing, it wouldn’t be so hard to wait and stop struggling against His perfect will. SO thankful and happy to have “met” you today and looking forward to following your blog! God bless you! Cheryl, earlier today I stumbled across some notes I had written last year about waiting was wasted time. It was a much needed reminder for me. It seems every where I read the last few days I’m seeing these little reminders that activity takes place even when we can not see it. It’s pleasure to have had our paths cross. I look forward to getting to know you more. Many blessings. Good Morning Wanda – Just spent time reading your links. Wonderful list! Truly! So much to think about & come back to reread. Love coming here on Saturday mornings! Always great when we can have time to savor some sweet reads. Oh, Wanda, can you believe I am on the verge of tears?! It is when we think that the waiting, the patience, will do us in, that we begin to realize that God is preserving us for what is appointed to us. May we have peace in the waiting. Ahh sweet friend, may we find peace indeed as He enlarges us so that we might hold we has promised. Wishing you a wonderful weekend. I too struggle with waiting. Funny how the best blessings, the ones that mean the most, are the ones that I can’t pick off the shelf like a pack of gum. There is great value in learning to wait on the Lord… guess that’s why He covers it so much in scripture! Thanks for the reminder, Wanda. Definitely needed. Great links! I can so relate to, “Sorry I can’t read your blog right now”. Have a beautiful and blessed weekend! It can be tricky to balance being supportive of others while giving yourself the enough time and space needed for your own creative endeavors. Have a blessed Sunday sweet friend! Denise recently posted..Just Chill Out! Endurance can be a stumbling block for me as well Denise. Because I often not start things if I feel as if I will not have the fortitude to see a thing all the way through to till the end. Hi Wanda!!! I’ve missed you my friend!! Waiting and patience…something I’ve definitely learned on my blogging hiatus, lol! I still haven’t decided when I’m coming back, but just wanted to drop by and show some love!! Blessings my friend!! Well hello there Michell, good to see you ms lady. I popped over to your blog not long ago and seen you were still on hiatus. Savor the moments. You will know when it’s time to return.